I have had a very busy month and keep getting too busy on Saturday to post. SO here is last week Teals and Aquas early for Saturday. My boys have been in a few indoor soccer matches. Last week end we had 6 games in 2 days. Two kids on two different teams, in different parts of town. They did great. Some team bests and some individual bests too. I got a few tulip heads done. One last pink one and 14 blue ones. 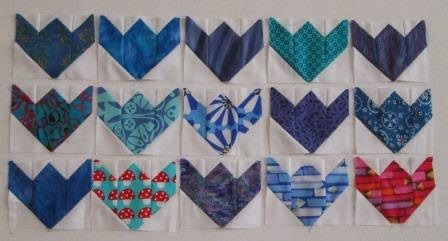 I have a teal aqua block done for my lanterns. I had to use the crazy little mushroom fabric. Love it. Look out for Soscrappy on Saturday. I hope to have another post for Saturday, I have been doing the sewing. Some puppy cuteness for you. Love your tulips! That pink one just sparkles in with the others. I've been seeing a lot of those lantern blocks this year. They look fun. Cute puppy. 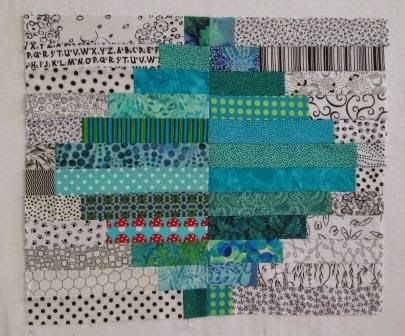 Great aqua blocks Cathy... love the flowers!